2344, USED RIM, 18X7-1/2, 5 LUG, 115MM, 06-10, DODGE, CHARGER, MAGNUM, STEEL, 5 SPOKE, BLACK. 3382, Used Rims,16X6, 5 LUG, 4-1/4", 00-07, FORD, WINDSTAR, SABLE, TAURUS, BLACK STEEL, 9 OVALS. 3382, Used Rims,16X6, 5 LUG, 4-1/4", 00-07, Ford, Windstar, Sable, Taurus, BLACK STEEL 9 OVALS. 3921, USED RIM, 18X8, 5 LUG, 4-1/2", 42MM OFF SET, 13-16, FORD, TAURUS, BLACK STEEL, 5 SPOKE. 5407, USED RIM, 17X7-1/2, 6 LUG, 132MM, 09-12, CHEV, TRAVERSE, BLACK STEEL, 6 SPOKE. 62397, Used Rims, 16X6-1/2. 5 LUG, 4-1/2", 02-06, NISSAN, ALTIMA, BLACK STEEL 18 ROUND HOLES. 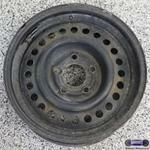 63687, Used Rims, 14X5.1/2, 4 LUG, 100MM , 88, HONDA, ACCORD, BLACK STEEL 16 ROUND HOLES.